Senior shooting guard Brandon Prox has recently etched his name into Mt. Hebron Basketball’s history. 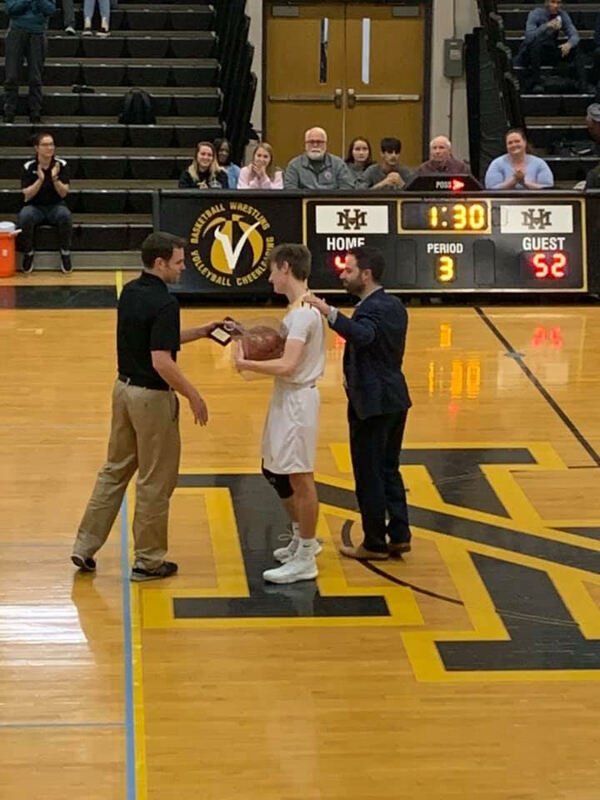 On Jan. 16, Prox scored his 1000th point in his high school basketball career with the Vikings. This was a part of Prox’s 30-point night against the Scorpions of Oakland Mills. Leading up to the game in which Prox scored his 1000th point, he needed to score 16 points, but ended up pouring in an extra 14 points instead, resulting in a total of 30. The game finished in double overtime, and the Vikings lost the battle to Oakland Mills. Prox’s illustrious high school basketball career began back in November of 2015 when he first tried out for the Mt. Hebron boys basketball team. At the time, Prox was a freshman, hoping to make the team along with the 65 others who tried out for JV. Prox was picked up by the varsity coach who at the time was Mr. Mike Linsenmeyer. Coach Linsenmeyer immediately recognized his potential. Not only did Prox make the team, but he also earned a spot as a starting player. Prox described his freshman season as, “nerve-racking, but exciting at the same time.” He explained how he looked up to his senior teammate, Lance Madden. “He was a great leader,” said Prox. “[Madden] was very encouraging, and he always made me feel like I fit in. Every game, I felt like I had to prove a point, that I deserved to play,” he explained. Prox has demonstrated his skill and passion for the sport through his play according to coaches and teammates. “He truly put on a show,” according to current Mt. Hebron basketball coach Mr. Jared Ettinger. “His game has certainly evolved. He is more versatile and can score in more ways than just spot up shooting. If I had to compare Brandon to an NBA player, it would be J.J. Reddick of the Philadelphia 76ers. Reddick has an elite jump shot but can also score in a variety of other ways. Both Brandon and J.J. have sneaky and under-rated athleticism. Brandon is certainly the best shooter I have coached to date,” explained Coach Ettinger. To celebrate his milestone, Prox received a customized basketball with his name painted across the front, including the years he has been on the team and the number 1000 written across the center. The ball was designed and painted by senior Sierra Faish. The ball was presented to Prox, along with a plaque by Coach Ettinger. “It was an awesome moment,” explained Prox about the recognition he received. But he was “more focused on the game,” he said, which highlighted his drive to win.